Sometimes you make things because you want them, not necessarily because they’re something that will be in constant rotation in your wardrobe. This dress is one of those things. 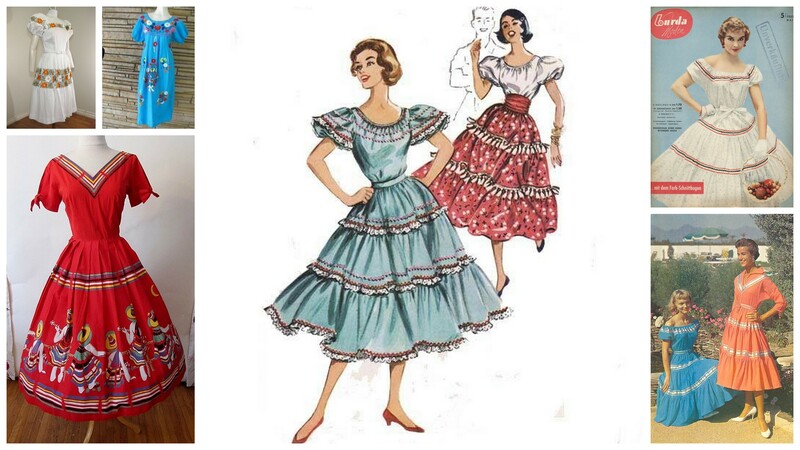 I’ve been dreaming about having a 1950’s vintage peasant dress with Mexican inspired embroidery for a long time. I pondered a lot about this and last year picked up a vintage 1950’s peasant dress pattern to make one. I considered leaving it plain — sans embroidery — or asking my MIL to machine embroider it, but in the end I opted to embroider it all by hand, which definitely was the slow way to do this. It took me about two months to embroider the bodice and would have been much longer if I had embroidered larger flowers as I had originally intended to do. 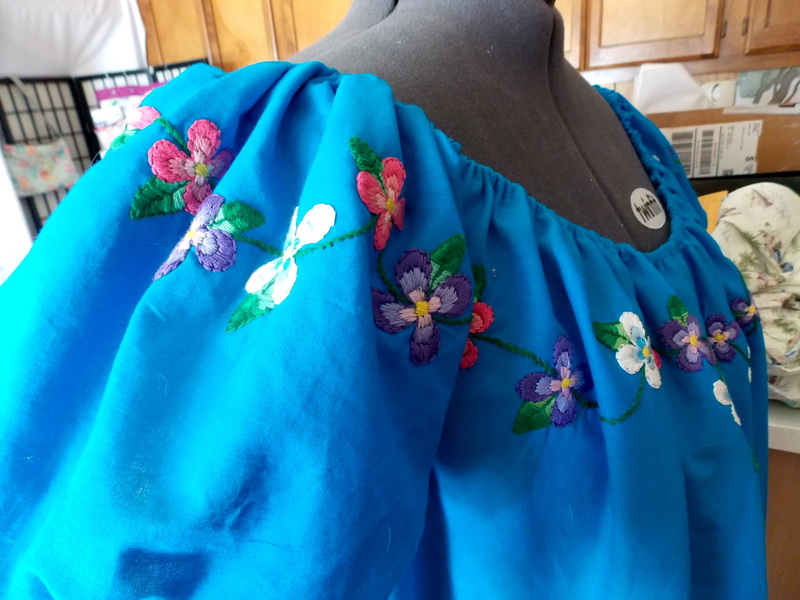 I even had aspirations of adding more embroidery to the skirt, but it became quite monotonous as I went along and I wasn’t even sure how long it would take to embroider the neckline. Two months seemed like a long time to me, but as a friend told me yesterday — it really isn’t that long — especially when one is crafting a labor of love. My inspiration for my dress came via many photos I’ve seen over the years of 1950’s peasant dresses. 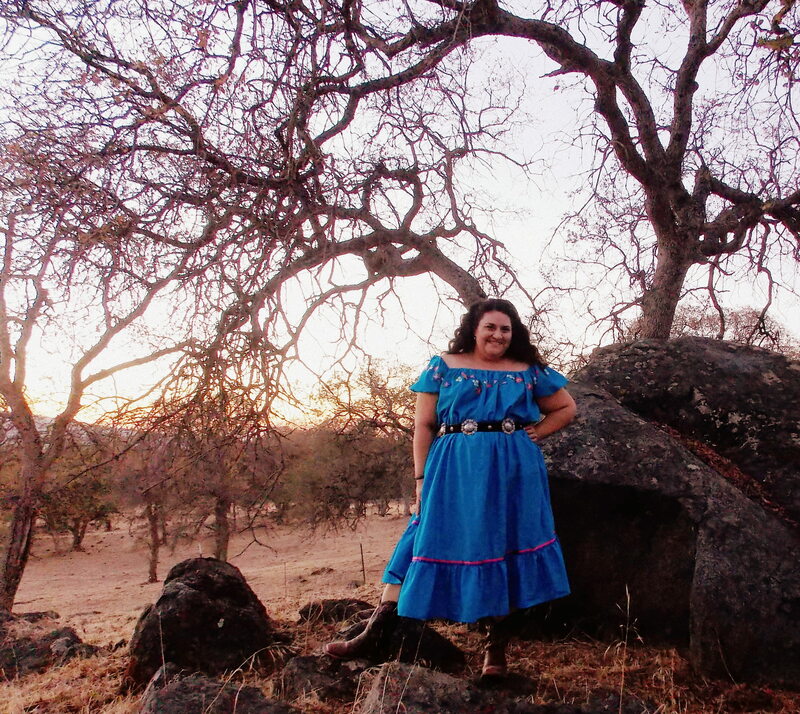 During that time, American fashion was influenced greatly by Mexican and Southwest designs. I used a vintage pattern from the 1950’s to make this dress. I had to grade it up quite a bit (yes, this is the same dress from my shift grading tutorial), which of course led me to put this project off as I’ve had this pattern for over a year. This pattern does not have a date printed on it, but it’s definitely from the 1950’s and sources say it’s from 1951. This is a basic chemise dress with a gathered neckline and sleeves which looks rather like a tent when not belted. 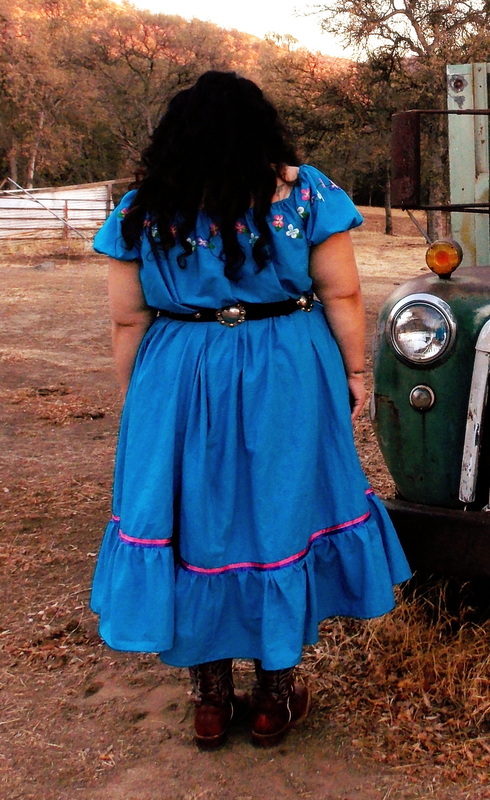 I used a turquoise cotton broadcloth for this dress and sewed all of it together (with the exception of the bottom ruffle) before I began my embroidery. I did not do any gathering until after I was done with my handwork. My embroidery is all freehand and I didn’t have a pattern nor did I draw it out first. I actually hadn’t done any embroidery for many, many years, so I was just getting back into it when I started this. Instead of a traditional Mexican design I chose pansies as they are my favorite flower. After I finished the embroidery, I made casings on the neckline and sleeves and added elastic. The pattern instructs to gather these and permanently sew them in, but I’m for a bit more comfort and opted for the elastic. 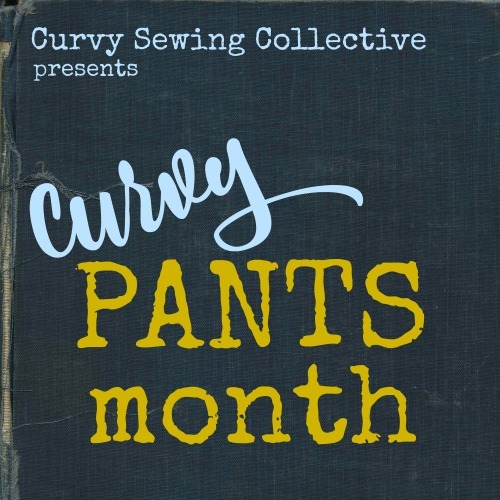 I also finished my inside seams with my serger — so I’m obviously not a true vintage sewist. I like retro styles with more of a modern twist which includes making things the more modern way. This fabric also likes to fray a lot (and wrinkle!) and I didn’t want to deal with pinked seams while I was embroidering this. I added two rows of coordinating ribbon above the bottom ruffle, which mimics my pattern and inspiration photos. 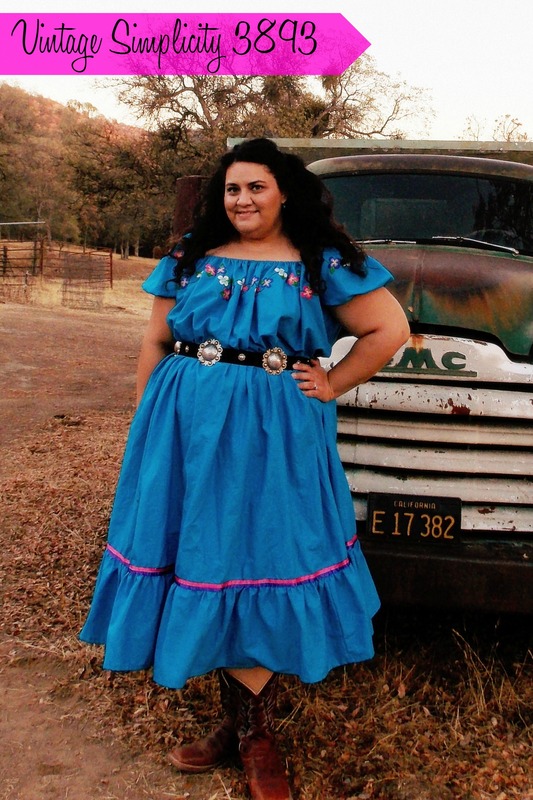 I also made my leather and silver concho belt, which is what I had always intended on wearing with this dress. I live on a ranch and have been riding and roping since I was a kid, so this style suits me. « We were all beginners once! Looking back…. That is just lovely! Back in the day…..In high school in the 70s, embroidered peasant tops were so popular. You look beautiful. This truly is a labor of love and I bet you wear it forever! Hooray for you for following your heart, and doing such a beautiful job! I really hope that you wear this dress more often than you think you will at the moment. Dreams made manifest are good things! Thank you, Lara! 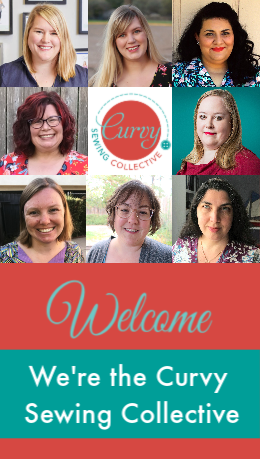 🙂 It’s always nice to dream up something and have it come to fruition! The dress is gorgeous and the embroidery makes it. I’m really drawn to details like this as they turn ordinary clothes into heirlooms. Isn’t embroidery and hand stitching fun? I do free form bead embroidery and love it. I also make books hand stitched. Just finished seven book with the covers covered in used tea bags, then bead embroidered on the front cover. Than I do the coptic stitching to hold the book together. I just love the finished project. My drawings and painting also reflect a bit of my passion for beads! I n short (long) I just love your dress and really want to make one for myself. Wow, Ann! You truly are a master! I’ve also done my fair share of bead embroidery. I like how quick the floss embroidery is compared to the beads! Thank you, Kat!!! 🙂 It gives me something to do when sitting and watching tv! This dress looks gorgeous on you! Very impressed with the embroidery. Absolutely gorgeous! I cannot believe you didn’t plan it out-it is sensational! Thank you so much! I was pretty glad it didn’t turn out all messed up when I was done! You won’t wear it all the time, because it is your secret weapon dress, the one you wear when you choose to reveal your super powers! I knit a Bohus Wild Apple sweater for a year, and when I need its power, it’s all ready to go. 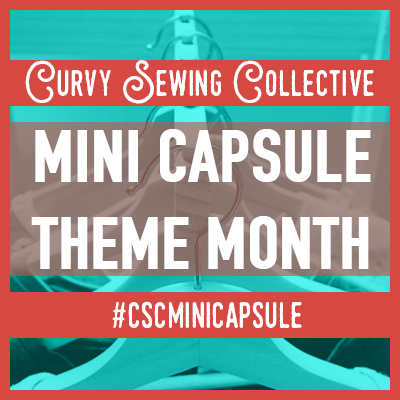 There’s just so much “holy moley you made that” handmade/wellmade goodness people can take. I have owned and made several patio dresses over the years, and they are always the right thing to wear when you aren’t sure what to wear. Parties, weddings, you get it. Thank you!!! I think you’re probably going to be right! To me, it’s always good to have an arsenal of clothing in your closet for any occasion! Yes, Linda! It does remind me very much of her dresses. 🙂 I think you need to have a Mad Men esque dress! Do it! This is simply gorgeous. Wow. You took a fairly simple idea (big tent dress) and made an heirloom! I have been embroidering pillowcases for years – only recently have I been inspired to spread it further to clothing. I also took up knitting last year, although it sort of attacked me and became an obsession. Both crafts are so meditative and make nighttime TV time so much more enjoyable. Wow, that dress is a work of art – you look lovely in it! I can’t believe you made the belt as well! I really enjoy your posts, they inspire me to be courageous in my creating! Thanks, Mel!!! I’d probably make just about everything if I could! haha! I love it! You and your dress look Wonderful!. All of your hard work has definitely paid off. The belt and the embroidery makes this lovely dress. Thank you, Ann! 🙂 I sure am happy how it turned out. Sometimes you never know! You did a beautiful job. From the color you picked to the flowers you embroidered. It really suits you. Your dress is beautiful on you. The embroidery is stunning, truly a labor of love. I have plans for something similar, a tunic I think. Thanks for sharing and the inspiration! Thank you, Lettetia! And embroidered tunic would be soooo lovely. There are a lot of patterns out there that would be perfect canvasses for embroidery. Oh my gosh! I was absolutely floored when I read that you free-handed all those pansies! Impeccable work! This is so gorgeous, I’m ending every sentence with an exclamation point! !! Definitely a labor of love, and you look fantastic! thank you, Josie! I wasn’t sure how it was going to turn out when I started, but I sure am happy with the outcome! This is so beautiful! Lovely color, amazing embroidery and it looks wonderful on you! Thank you, Jessica! I love everything about it! It’s gorgeous! I hope you wear it lots, because you look great in it. this is beautiful.. the blue looks so pretty on you.. I just love, love it..
encouraged me to do an embroidered peasant top .. thank you for sharing. This is so incredible! What a one of a kind piece and you look so dreamily romantic.. Absolutely stunning. Love the freehand embroidery – beautiful stitching. Thank you, Kathy! I’m really happy with how it turned out. It turned out great! I can’t believe you free handed all those flowers! Tanya I lurve it!!! Sometimes a gal just has to sew what a gal wants with no regard for how often it will get worn. I suspect though, that you are gonna wear this more than you think you will! I have to ask, where did you get your concho belt supplies? Thanks, Alicia! I think you’re probably right. 🙂 I got my belt supplies from conchos.com. I made this belt last year and am planning to make another, so when I do, I’ll post a tutorial on my blog. 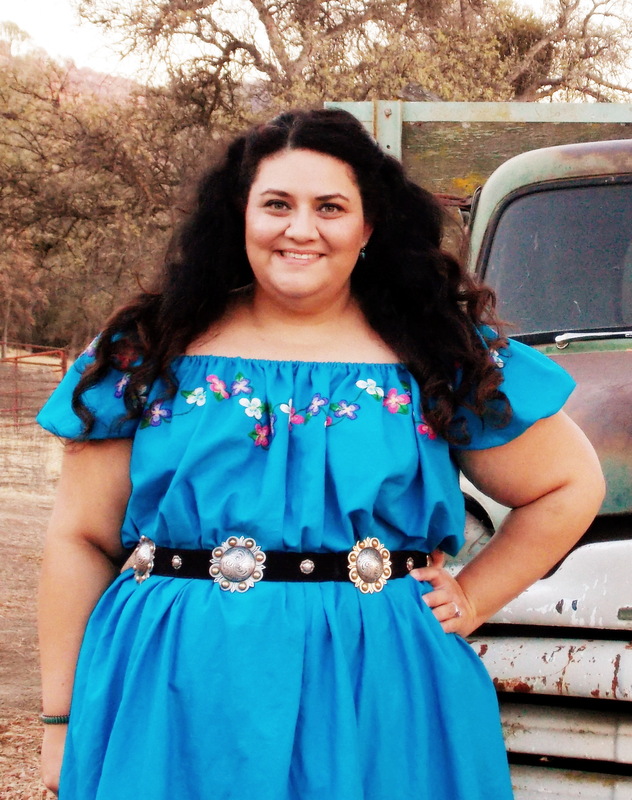 It’s very easy to make and MUCH cheaper than paying upwards of $300 for a concho belt. Oh Emm Gee that is the beautifullest thing I ever saw. Please wear it every day. I would! Tanya, I love your dress and belt! Your hand embroidery looks beautiful! As for what to do while relaxing on the couch, do you knit? Thank you! 🙂 Funny you ask that because as soon as I was done with the embroidery and sitting there with idle hands, I took out my knitting bag and started working on a UFO scarf. I just took up knitting last year and am going to be knitting my first sweater soon!